Dimapur, Nov 1 : Call it an uprising or an awakening call. The message was loud and clear. The people of Dimapur have come out on to the streets in thousands to express their resentment and opposition against illegal and unabated taxation imposed on them and vowed not to pay multiple tax to any underground group. They have also resolved not to be cowed down by the barrel of the gun and to take the responsibility to shape the future of Nagaland. Joining the ‘Public Awareness Rally’ called by the Action Committee Against Unabated Taxation (ACAUT) against multiple and unabated taxation in Nagaland at Clock Tower here on Thursday, the rallyists supported the speakers with thunderous applause for exhorting them not to remain blind to the reality. 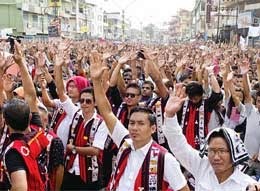 The rally, the first of its kind in Nagaland, received unprecedented response from the public despite the NSCN-IM imposing ban on it and warning to take steps or measures to obstruct what it called anti-national designs to murder the long struggle for national cause. Speaking on the occasion as the main speaker, former IAS officer and social activist KK Sema said the issue is to stand and fight against multiple taxation imposed on the people by various underground groups as well as government agencies. There will be a second plebiscite in Nagaland like the one in 1951 when the Naga movement was recognized as a political issue if all the districts of the State join hands together to curb this menace of taxation. To this end, various tribal hohos in the State have a major role to play, he explained. “We have not gathered here to fight with any underground faction but to reason with them that there has to be the rule of law, a system to control life,” he stressed. “If we do not point out their mistakes, how will they know?” he said. Describing today’s rally as the first step towards change in Nagaland, Sema urged the gathering to carry forward the movement, saying no one can make any progress if they continue to pay tax for everything. “How will we live if we have to pay tax for everything?” he asked. He said the Naga people are not against paying tax. “Take tax but through rules,” he stated. There has to be ‘one tax one government’, he opined while questioning the existence of so many factions in Nagaland. “Henceforth, there has to be the rule of law, a system to control our life,” he stressed. Sema also took the opportunity to take a dig at the State Government and said the government is also doing what the underground factions are doing. He referred to various forms of corruption at the government level. President of the Naga Council Dimapur, Bangeraloba termed the rally the beginning of a social awakening. He hoped that with this awakening, procedures and rules would be streamlined, while also stating that this is an opportunity for the Naga underground groups to sail together with the Naga public. Naga Mothers Association advisor Rose Mary said women and children are the most affected by taxation. Appealing to the State Government to play its role to protect its citizens, she called for freedom of thought and expression. “Inaction of the government is forcing the Nagas to go against each other,” she stated. She further assured of all support to the ACAUT in its endeavour to free Nagaland from all forms of illegal taxation. In his solidarity message, Nagaland Tribes Council president and former IFS officer T Solo recalled that the Nagaland independence movement started on the sole principle of not to pay tax to the British regime. But today in Nagaland, tax is not taken only for sunshine, he quipped. Solo said he had never heard of any nation taking tax through guns. Tax is collected by pen, he explained. “We will not allow guns to collect tax,” he said. “Pen is mightier than the guns. We will defeat guns,” he asserted. Leaders of other civil society organizations, who also spoke on the occasion, echoed the same sentiment and extended their support to ACAUT. After the rally, the ACAUT adopted a three-point resolution recognizing “One Government One Taxation” only and decided to pay only one tax to one entity. This also means that as long as factionalism exists, the Naga public shall not pay tax. The Naga public also re-affirmed their support to the Naga movement and strongly urged the Government of India to settle the Indo-Naga imbroglio at the earliest. It also demanded that the Government of Nagaland constitute a high powered committee within 15 days to study the whole gamut of unabated taxation and illegal collections involving the Naga Political Groups and government agencies/departments. The ACAUT said the committee shall consist of atleast five members headed by a retired judge of the Supreme Court or High Court with at least two members from the ACAUT. The committee should submit its report within two months with its findings published in all the newspapers. If the government fails to constitute the committee within the said period, the ACAUT will initiate further action in consultation with the public.